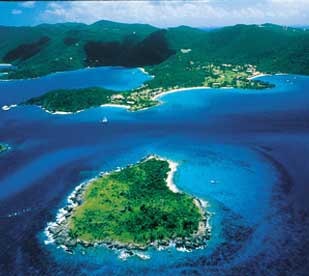 The US Virgin Islands of St. Thomas, St. Croix and St. John provide outstanding vacation choices for all tastes. Once the refuge for the infamous pirate Blackbeard, features world-class resorts and some of the best golfing in the Caribbean. Most of the action is found in the capital, Charlotte Amalie, with its renowned duty-free shopping and nightlife. St. Thomas hotels are famous for their romantic atmosphere and seclusion, yet adventure is never far away. From snorkeling, scuba and deep-sea fishing, to walks along a quiet cove; there is something for the whole family to enjoy. Boasts massive stone forts and elegant Danish and Victorian buildings for exploration. For water lovers, Buck Island Reef National Monument is a must. There are 880-acres to explore in this reserve and a snorkeling trail revealing the island’s diverse marine life. St. Croix also offers an impressive casino on the island for those wishing to test their luck – the first and only casino in the U.S. Virgin Islands. Include a few rounds of golf while in St. Croix …two St. Croix hotels have award-winning, challenging championship 18-hole golf courses. Other activities include tennis, horseback riding, diving and fishing. Once the playground for the Rockefellers, the island maintains its secluded atmosphere, and a series of national parks protects the land from development. There are endless opportunities for outdoor and underwater adventure or for simply relaxing on a secluded beach. St. John is also an ideal honeymoon escape. Activities include hiking through lush tropical forest, snorkeling, fishing or bike touring. With St. Thomas only a twenty-minute ferry rider away, you can easily spend a day strolling through the fabulous shops and restaurants, or take an excursions to the nearby British Virgin Islands. With all of St. John’s charm and romance, it’s understandable if you find it hard to leave. If you explore one island or all three, you can’t go wrong. Each has gorgeous sugar white beaches nestled in secluded coves with lush tropical forests and flowering foliage everywhere you turn along with magnificent diving and fishing, water sports for the whole family, outstanding duty-free shopping and friendly locals. This entry was posted in All-Inclusive, us virgin islands, Weddings/Honeymoons and tagged All-Inclusive, Deep Sea fishing in US Virgin Islands, Family Friendly, Golfing in US Virgin Islands, Honeymoon in US Virgin Islands, Snorkeling in US Virgin Islands, St. Croix, St. John, St. Thomas, us virgin islands. I’ve been looking around carterelitetravel.wordpress.com and really am impressed by the amazing content material here. I work the nightshift at my job and it is so boring. I’ve been coming right here for the past couple nights and reading. I just wanted to let you know that I’ve been enjoying what I have seen and I look forward to reading more.